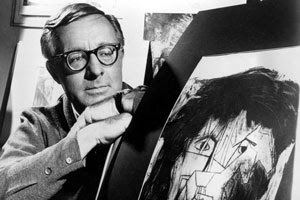 First Nerve: Ray Bradbury, R.I.P. There are many reasons to mourn the passing of Ray Bradbury. Here at FirstNerve, we think of the effortless way he brought smells to bear in his fiction. Read Fahrenheit 451 with your nostrils open. You’ll have nightmares about the Mechanical Hound, but also know that freedom has a scent. Then read about the Happylife Home in The Illustrated Man and see how a description of smell can make the hair stand up on the back of your neck. Ray Bradbury, dead in Los Angeles at the age of 91.